Whether you’re stepping for your next sortie or walking down the street, you’re never really dressed without a hand-crafted timepiece from Bremont. Bremont Watch Company and Martin-Baker have collaborated to design and build the ultimate aviation watch that will embody all that is meant by ‘Made in Britain’. 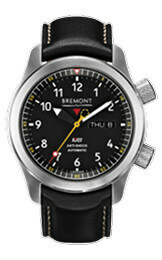 The Bremont MB1 / MB2 watch has successfully endured 12-30G throughout the first second of ejection. These are the first watches to ever go through a live ejection seat testing programme. As the pioneer of the ejection seat, Martin-Baker represents the pinnacle of British engineering. The partnership has combined Martin-Baker’s knowledge of testing, materials and design with Bremont’s watchmaking skills. Our aim was to challenge conventional mechanical watch design by applying standards that truly define ‘a matter of life and death’. An ejection seat may sit unused for 40 years, but, the day it’s needed, it has to work. Martin-Baker’s testing facility is unique, and the Bremont MB watches have been through trials found nowhere else, even simulating 30 years of aircraft life through a vibration testing machine. There are two models available: the MB1 and the MB2. The MB1 is only available to those individuals who have ejected using a Martin-Baker ejection seat and can be identified quickly by its red aluminium barrel. The movement is protected by an anti-magnetic Faraday cage and a specifically designed anti-shock case mount. 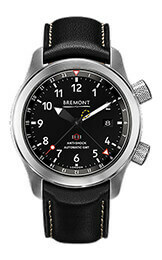 The second edition of the watch, Bremont MB2, will be available for sale alongside the full range of Bremont watches, but, as with all Bremont timepieces, the annual production will be very limited. 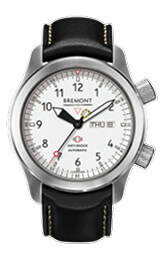 The movement is assembled at Bremont’s atelier in Switzerland, but final assembly of the watches takes place in the UK. The MB1 and MB2 are Bremont’s first ‘Made in Britain’ wristwatch.